Shower Curtains There are 14 products. 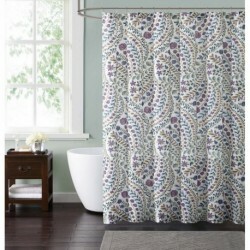 Detailed repeating floral shower curtains in scroll print with white base face cloth of 100% cotton fabric with hints of teal and purple. Large scale floral duvet sets in blue on a textured grey base face on a 100% cotton fabirc. Detailed repeating floral scroll shower curtains in blue print on a blue base face on a 100% cotton fabric. Southwest shower curtains in diamond striped style print in softer colors in blues and tan colors in a 100% cotton face cloth. Classic floral scroll print with a blue base with tan vines have flowers of rusty reds and soft purple shower curtains. Textured print pattern for a dramatic statement on 100% brushed microfiber to bring a soft textured component into your bedroom. 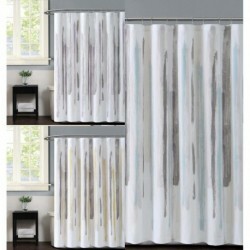 Waterfall brushstroke style print in shades of citrus yellow and gray for a dramatic statement for your bathroom. 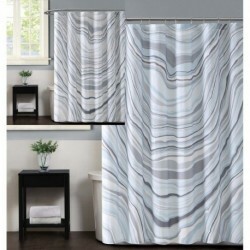 Graphic marble style print in shades of tan and gray comforter sets and accessories for your bathroom. 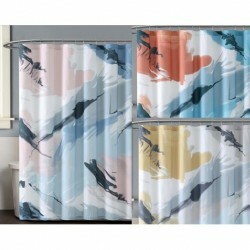 Artistic brush stroke pattern for a dramatic statement for your bathroom in this designer bedding collection. 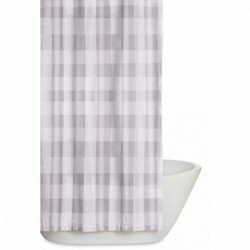 This large buffalo check print features a white background and grey intersecting pattern on the face of the shower curtain. 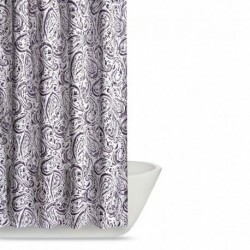 Shower Curtains in eggplant purple paisley pattern in a watercolor style easily coordinates to bath room. 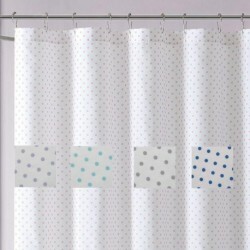 A simple dot pattern in fun colors in 100% microfiber sheets are designed to be super soft and easy care.